“Islam does not conceive what we call freedom of worship,” stresses Syro-Catholic Archbishop Jacques Behnan Hindo of Hassake-Nisibi in Syria. As for the rest, hard is the condition lived by the religious minorities in that decimated region of war and Muslim fundamentalism. Among the reporters of the conference to present the “2016 Report on Religious Freedom” of Aid to the Church in Need, Archbishop Hindo gave his direct testimony without censure of coexistence with an Islam of the majority. “I could mention hundreds of verses of the Koran, in which the homicide is authorized of one who is not Muslim,” he explains to ZENIT. However, what is worrying is not so much the presence of these verses in the holy Book, but the literal interpretation of the same by many Muslims. Not only Daesh (acronym of the Islamic State in Arabic, ndr), belongs to certain fringes but also that galaxy of “300 or 400 organizations” that fight against the Damascus Government. Their fidelity to “hard and pure Islam,” namely, to Sharia – adds the Prelate — renders them inevitably intolerant of any other worship. It is forbidden for a Muslim to abjure his faith,” according to “laws transmitted orally.” Moreover, for one who isn’t a Muslim, considered in a contemptuous way a dhimmi, the payment is rendered obligatory of a tribute to the Authorities, the punishment being his physical elimination. According to Archbishop Hindo, an Islam cannot exist that is not also political and exclusivist. For this reason he has put the accent in particular on the Wahabit wing, which sinks its historical roots in Saudi Arabia and which still prospers in that kingdom and radiates in the Arab world and not only in it. “Wahabit is the Islam of the Daesh militias and Wahabit is the Islam that is taught in the Koranic schools financed by the monarchies of the Gulf” and spread everywhere. It is in these places, perhaps, that a great portion of those “close to 300,000 Western foreign fighters have gone to Syria in the last years to carry out the jihad. The Archbishop’s voice breaks with emotion when he recalls that every day he must mourn at least one soldier of the Syrian army from his diocese (which also includes Raqqa, capital of the Islamic State). And then he points the finger at the West, culpable – according to him — “of having financed armed groups” that, although they are presented as “moderates,” do not differ from Daesh. They are united by the same intentions, whose pursuit foresees the elimination of any obstacle. See then that ISIS does not only kill Christians but anyone who does not adhere to their fundamentalist interpretation of Islam, including lukewarm Muslims. However, now the most immediate problem is posed by Islamic groups. The Russian army has begun a vast operation against them at Idlib and Homs, while new bombardments are registered on Aleppo after a three-day truce. In fact the liberation of the important northern city of Syria can represent – according to the Archbishop – the antechamber to the end of the hostilities. “We wait with confidence,” he glosses. Archbishop Hindo then commented on the election of Donald Trump as President of the United States, who has affirmed that he wants to change the interventionist policy and improve relations with Russia. “If his intention is to collaborate for the liberation of Syria without sending soldiers, he has our support,” he explains. 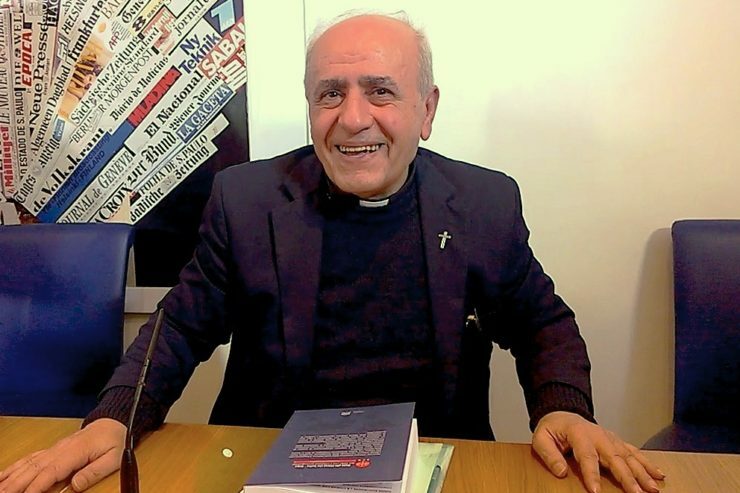 The Syro-Catholic leader then described as “a masterstroke” Pope Francis’ decision to create Monsignor Mario Zenari, Nuncio in Syria, a Cardinal. His request, however, remained a dead letter, and it will remain so only until next Saturday, date of the Consistory in which the Pontiff will put the Cardinal’s biretta on Zenari’s head. From that moment the Nuncio in Damascus will be a representative of the highest summit of the Catholic hierarchy – a sign of closeness on the part of the Holy See to the persecuted populations in Syria.